To edit the Digital Card, just go to your My Digital Cards page and click Edit button below to the card you want to edit. Make your changes and be sure to save the design. As soon as you save the new version, your recipients will see the updated version when they view the card. Any changes will be applied retroactively to any cards you have already sent out. 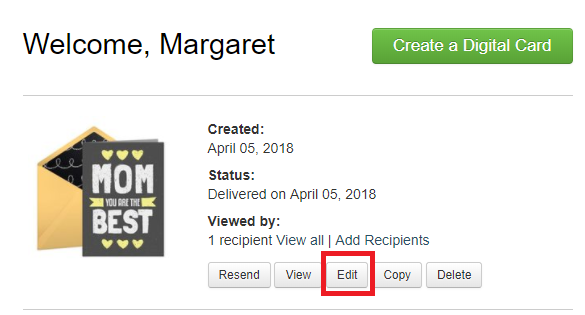 If you want to resend the card, click the Resend link next to the card on your My Digital Cards page.